We left on a Sunday morning. 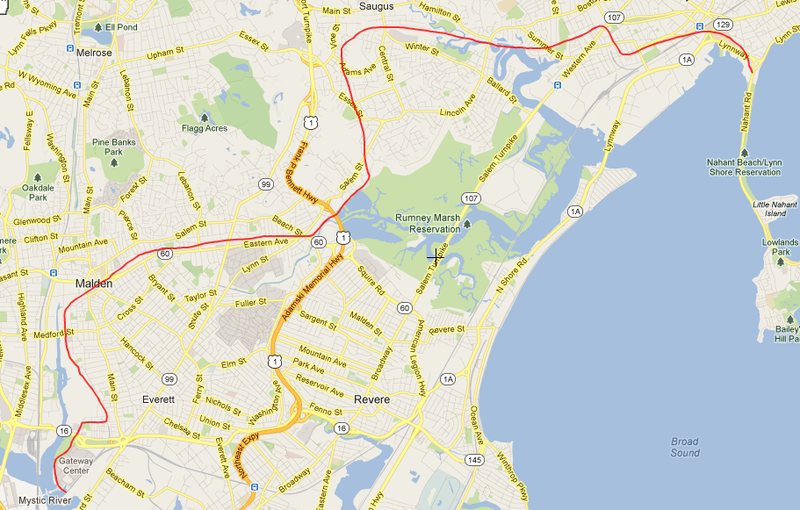 With the promise of less traffic, Sunday seemed like a good day to ride through the heart of the Boston metro area. In the weeks leading up to the trip, I wondered how I'd feel as we were leaving. Nervous? Excited? A combination of these and other emotions? That morning, it turns out, although I was a little nervous and very excited, part of me just felt at ease, like we were going for a two-mile bike ride to the store. Maybe it's part of the simplicity of bikes: open to the air, close to the earth, and built to go fast enough that you can cover decent ground in one day but slow enough that you don't miss the scenery. 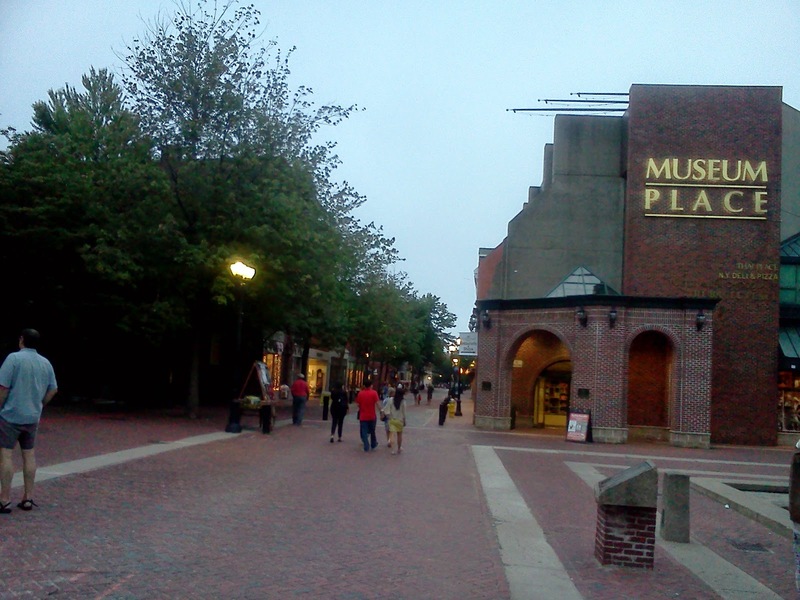 We reached Main St. in Waltham, crossed over the Charles River on Moody St., and then got on the Charles River Greenway, which took us east into Boston on an off-road, tree-lined shared use path. We arrived in Cambridge a little after noon via the Anderson Memorial Bridge over the Charles River (Streetview). MassDOT is upgrading this historic, 100-year-old bridge. Part of the renovation involves implementing a 4-to-3 road diet. 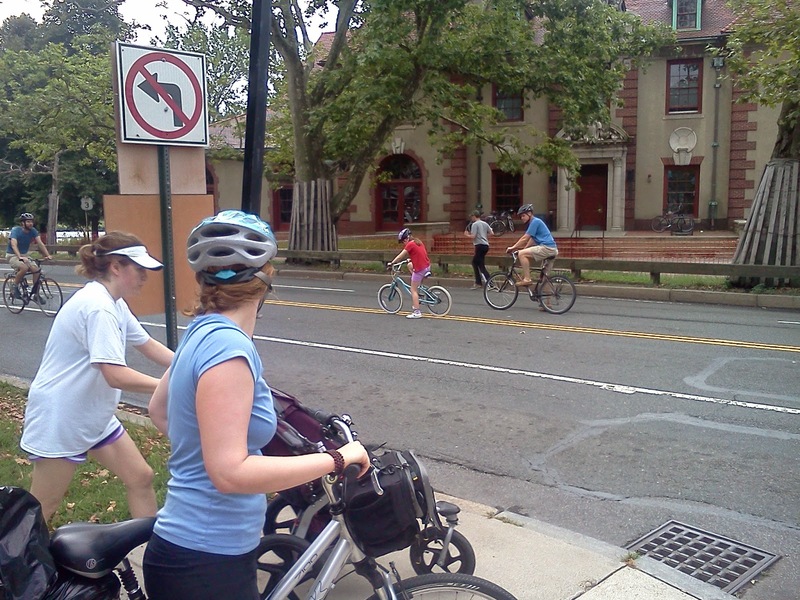 A southbound lane is being removed to make room for 5' bike lanes, retaining the 10-ft. sidewalks (PDF of MassDOT presentation - see especially slides 8 and 10). 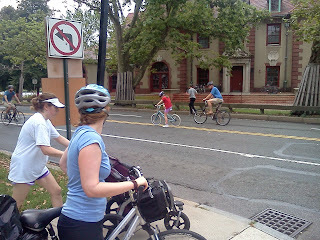 Just as we made it to the other side, we saw a steady trickle of cyclists leisurely coursing down Memorial Dr.: a ciclovia! The drive was closed to autos, and open to people, for Recreation Sundays (11am-7pm, Apr.-Nov.). We were departing temporarily from the ECG route here, which continues on the CRG to downtown Boston, so we could meet my friend Josh for lunch at The Druid. Mmmm, fish 'n' chips wrapped in newspaper. After leaving The Druid, we wove our way north to Fellsway, where we were to cross the Mystic River into Medford. Lo! 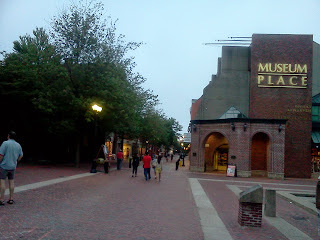 Here be Boston again, on Mystic Ave. near Assembly Square Dr. I have to say, this was a stressful experience. Traffic volumes seemed high for a Sunday, and we experienced the first of many frustrations with the lack of street signs (#%$^#%!). Moreover, as bike-friendly as Cambridge and Somerville might make themselves out to be, our experience confirmed what can be seen on a map: the actual bike facilities are predominantly on the east-west radial thoroughfares, but more lacking on the narrower, north-south streets, where on-street parking must be accommodated. For some reason, we confused ourselves (in reality, I confused Eve and myself) about how to get to Fellsway. It looks relatively simple on a map, but, long story short, we went on an inadvertent detour on the Alford Street Bridge instead (map). This took us toward the Northern Strand Community Trail via Everett instead of Medford. The NCST will be a great amenity when completed. Sponsor group Bike to the Sea's vision is "a trail free of cars from the Malden/Everett area of Massachusetts to the beaches in Revere, Lynn and Nahant. That dream is now close to reality as portions of the trail are under construction." Alas, we passed through a bit before the actualization of that reality, and had to detour on Eastern Ave.
...and, at Swampscott, we reached the ocean! We had re-hydrated via a Lynn corner store, and now it was time to take a breather along the seawall, as Eve's knee had begun to give her some trouble. We looked out over the water and the gray sky. Nahant Bay was in front of us, Massachusetts Bay past Nahant Bay, the tip of Cape Cod further out, and Morocco across the vast distance of the Atlantic. 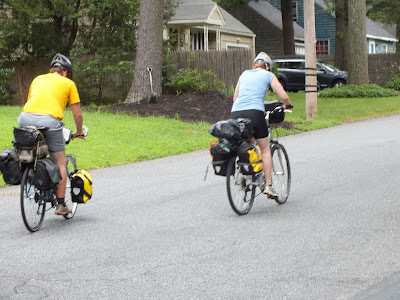 ...so we opted for weaving through Marblehead residential streets to the "attractive gate" at the Salem Bike Path (the words of a travel guide Eve read before we left). To be sure, the entrance did not disappoint, aesthetically speaking. ...the trip's first unpleasant incident. Stopped in the pole position at a red light on New Derby and Congress, we heard a man's voice somewhere amongst the queue. The voice was being employed to shout threatening statements at us, e.g. "Get out of the f***ing road!" Glancing back, it was impossible to tell from which exact motor vehicle it was originating. 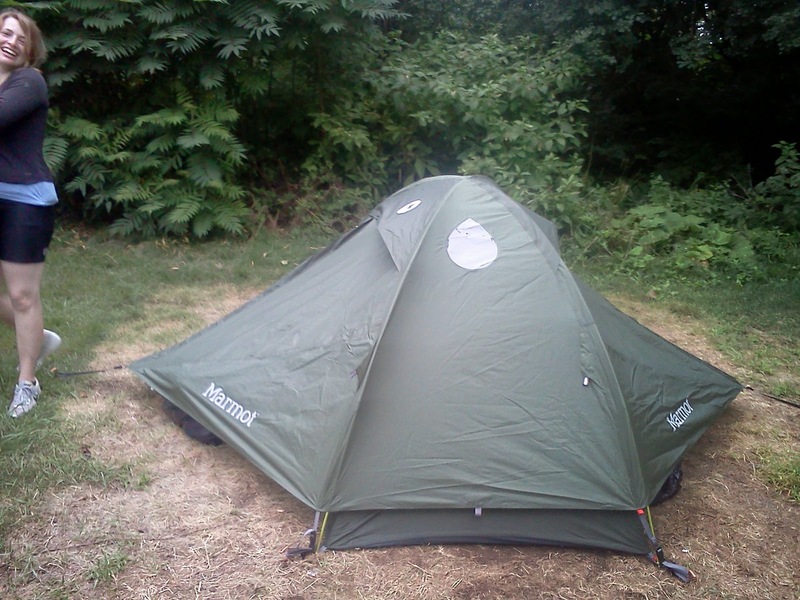 Even though this was starting to raise my blood temperature to near boiling, I decided it was best to walk our bikes to the corner, let this loquacious gentleman pass, get back in the road, and be on our merry way to the campground. He was turning right, though -- around us -- and as he did, he looked out the passenger window and spewed further epithets. I was busy getting my phone out to call the police, while Eve and I were simultaneously trying to remember his plate number. No sooner had he completed the turn, however, than a squad car zoomed, seemingly out of nowhere, but really from Congress St. going southbound, to pull the guy over. This all happened within a span of probably no more than 10 seconds. Another squad car followed 30 seconds later. We don't know if the reason the guy was pulled over was his threatening comments, and, if so, wondered how the first officer had heard the verbal barrage. But the driver didn't seem to have made any other moving violation. So I'm going to chalk it up to poetic justice. The lesson learned : if you experience a driver harassing you because of your choice of transportation, don't let it get under your skin. Simply try and take note of the license plate and report it to the police. The worst thing you can do is respond in kind with acidic language of your own. That little to-do in our wake, Waikiki Beach on Winter Island was calling our name, and it was starting to get dark. Arriving there was a sigh of relief. 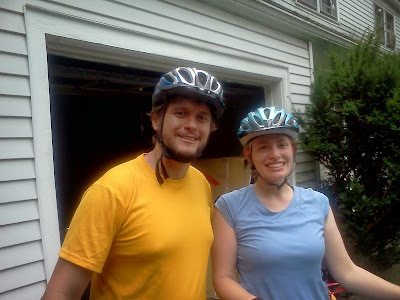 Despite some great paths -- the CRG, Northern Strand, and Salem Bike Path -- Day 1 nonetheless had its share of moderate- to heavy-traffic on-road cycling, capped off by the little road rage incident. Furthermore, Eve's knees needed a rest, and my mind needed a break from an involved day of navigating the Boston metro area. It was a misty, but warm, evening. There was a kids' drama camp putting on Macbeth next to our camp area. After setting up, we rode back in to downtown for the bike tourist's best friend, FOOD!, at the Village Tavern. Then, a stroll down car-free Essex St... ...and a stop at the -- enchanting? -- Derby Square Bookstore. It's too bad that the book is now closed on Derby Square Books. I'm glad we got to experience it. And that closes the book on Day 1!